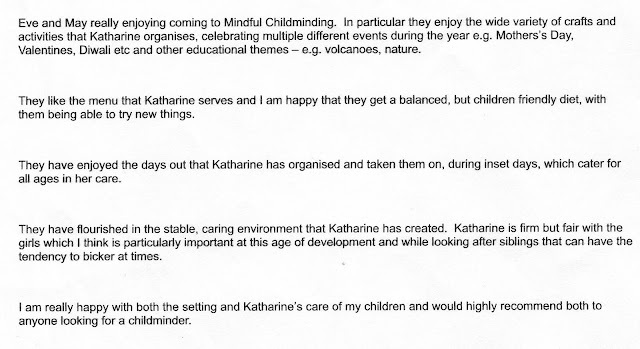 Katharine has looked after my 8 year old daughter for about 1 year, before and after school, during school inset days as well as some evening sessions. She would collect my daughter from school, cook her healthy, organic dinner and arrange fun activities for her and the other children. 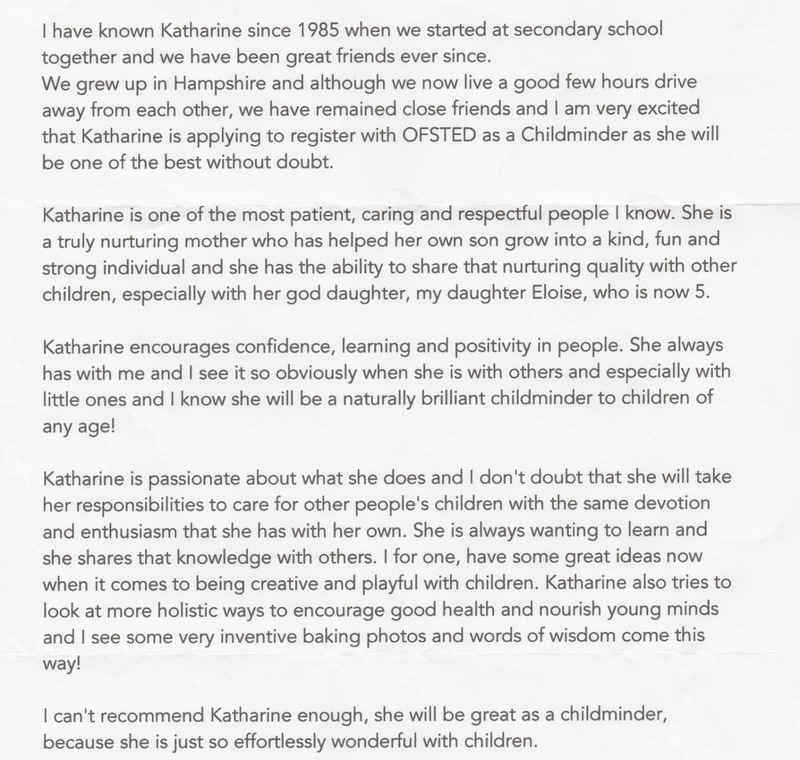 I can always rely on Katharine - she is very conscientious, incredibly patient and very passionate about good childcare! I never have to worry about my daughter when she is in Katharine's care, I know she is in great hands. Katharine always goes the extra mile to make sure the children in her care enjoy themselves and I am always impressed by the imaginative activities she thinks of for the them! 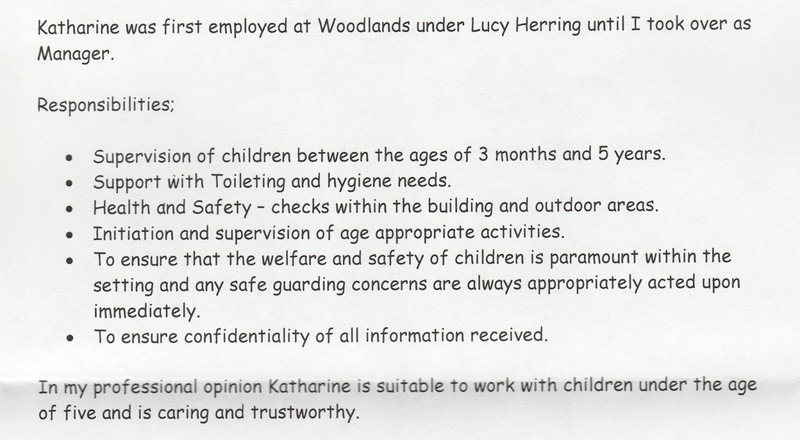 I can wholeheartedly recommend Katharine to care for children of any age. 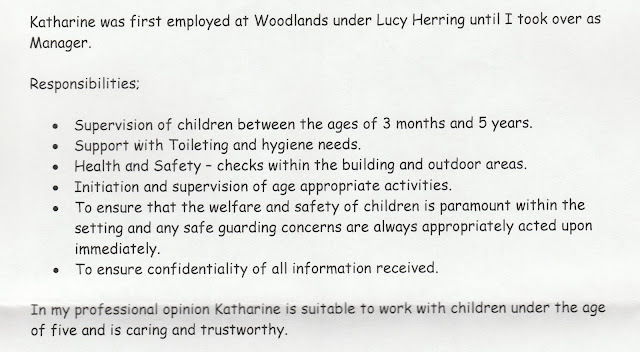 Katharine was a child-minder for my daughter while she was in Year R at Fleet Infants. She was always reliable and very caring towards my daughter. She was very organised administratively, and very communicative. She always has a craft activity ready for her mindees, and frequently my daughter came home with a creation she was very proud of. Katharine always made sure that special occasions such as mother's day, family birthdays and special days in the calendar were remembered. She also set boundaries and kept to the same routine so that the children could feel safe, accepted and competent. When I had to ask her for help with extra care in emergency situations, she was always very willing and flexible. When my daughter left, Katharine and the other children in her care made a very thoughtful leaving present. Her philosophy of "mindful childminding" by paying children the attention they crave and deserve is something we can all learn from. My two children loved coming to Katharine's. They got to do so many different art and craft projects with her with a wide range of materials. They enjoyed playing with her toys and the other children. Katharine adjusted her activities to link to religious/secular holidays - something schools have little time for nowadays. My children settled in easily. Katharine was always warm, welcoming, cheerful, positive, caring, calm and helpful. She responded to any last minute arrangements that I made. We no longer use her because my husband or I are now able to collect every evening. 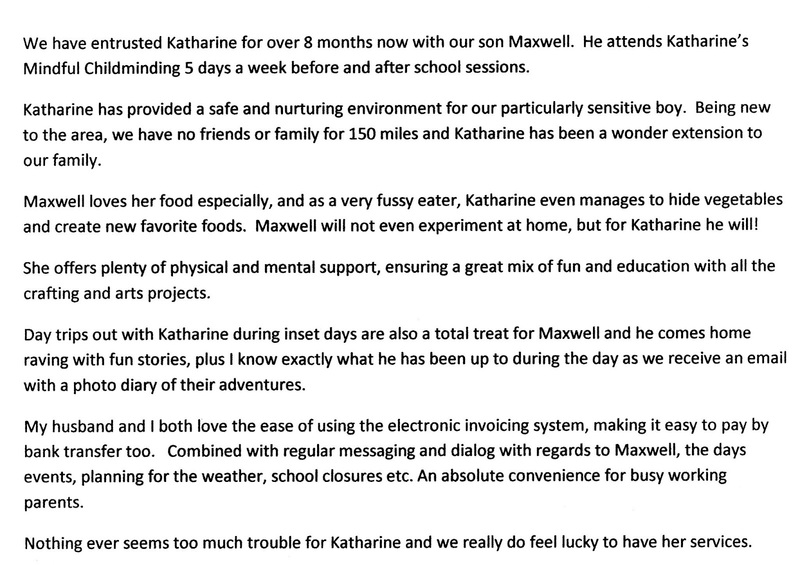 Katharine has been looking after my daughter for two years, before and after school. My daughter really enjoyed her time at Katharine’s house. She particularly liked doing the arts and crafts that Katharine would provide. Also, she also loved playing with other children in the playroom upstairs. Katharine always makes delicious dinners and offers healthy breakfast to get her ready for school. Katharine is a lovely, kind, caring childminder. I am always relaxed at work because I know that Katharine is looking after my daughter and she’s in safe hands. 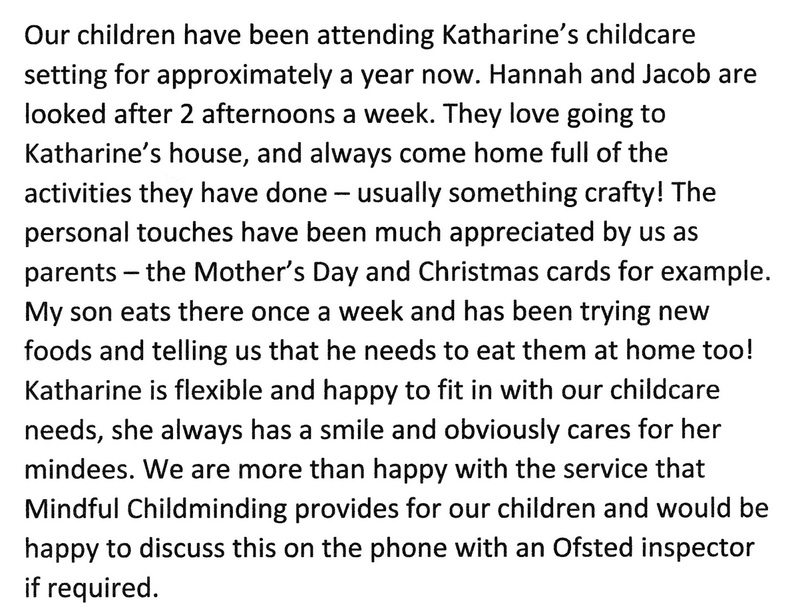 I would definitely recommend Katharine as your childminder. 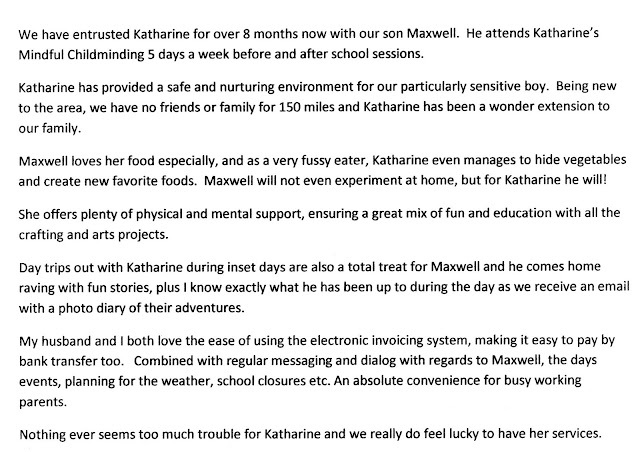 Thank you, Katharine, for the wonderful care you have provided. Katharine has been looking after me for two years and I have really enjoyed my time at Katharine’s. From the day I started until the day I left, Katharine would always be looking after me extremely well, constantly putting a smile on my face. At Katharine’s house, I love doing the arts and crafts and at home I have a massive box full of the crafts that I did with Katharine. As well as that, I loved making new friends and playing with them in the playroom. At my time at Katherine’s, I have made 8 great friends who I now play with/see on a day to day basis. Katharine’s food that she makes is delicious and she’ll always make a food that you like. 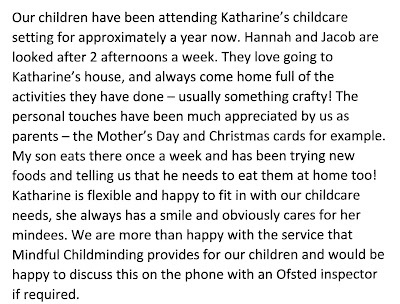 I definitely recommend going to Katharine’s house as she is an amazing, kind, creative and caring childminder." My son really enjoyed his time at Mindful Childminding. He looked forward to go there everyday. 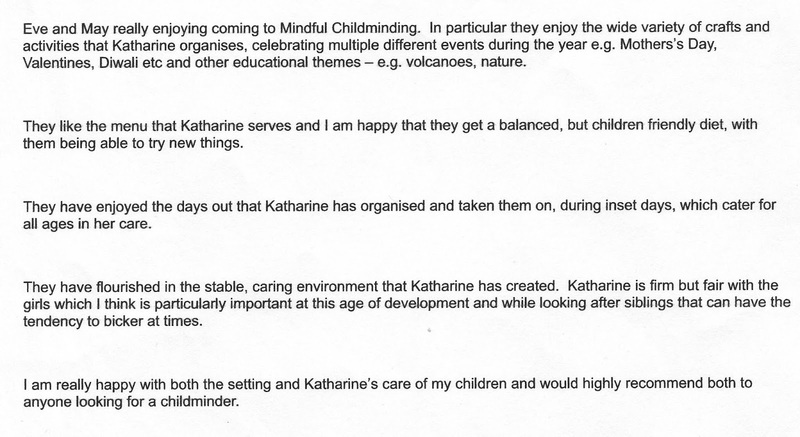 Katharine is very organised childminder and always keeps us abreast of anything that we should be knowing in advance. I also liked the fact that I can manage the payments online. I know my daughter loves Relax Kids and that is down to the wonderful atmosphere that you create for the children and fun with which you deliver the class. My daughter enjoyed the class and said she could have fallen asleep! She was clearly relaxed! I wish it were for adults too! It sounds very good. Sounds like you had a lovely morning; I wouldn't mind my day starting so calmly!! Thanks for the sheet [parent handout] we will have a go at some of these techniques - I may even try a couple myself. My son said he really enjoyed it [the Relax Kids class], in his words "it was brilliant!" Been meaning to write and thank you for the wonderful sessions you provide. We have enjoyed talking about what you do in the sessions, the follow ups [parent handouts] you email are very useful. I feel my son and I have both really benefited from his time with you. I feel he is calmer and we try and use the strategies that you talked about when dealing with angry feelings. We both enjoyed writing the list of what we are thankful for, it made us think about how fortunate we are. Added bonuses are it helps with his school work - reading and writing! He really enjoys the sessions and never grumbles about coming, which he sometimes does with his other clubs. We have stuck up the handouts he brings home near his bed so that we can reflect on them at bedtime. Thank you very much for all the effort you put in, it certainly pays off! Thanks for putting on the relax kids classes – I think it’s a great idea. My daughter enjoyed the classes and seemed to start looking forward to them more as they went along. She said her favourite things were doing the “sledge” (the children took turns sitting on a ‘sledge blanket’ and the other children were husky dogs pulling it along), listening to the stories and getting cosy in the blanket. She does seem to have been a bit more settled at bedtime recently so maybe the classes have helped in that. Thanks. Her very favourite bit was the snow ball fight (we used ball pool balls in the Winter Wonderland class). Sounds very interesting!!! Sounds like you did a great job as kids just don’t lie! Well done and congrats!! My daughter said that her favourite part of the relax kids class was resting under the cosy blankets at the end! However, her initial answer was everything! - so I guess it must be working and as you know she has tried to get her siblings to take part in her own re-creation of the class which was highly amusing! !